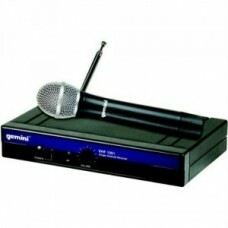 The GEMINI GM-1000 Wireless Microphone System is designed to provide clear natural sound quality in any environment. With a range of up to 100 feet you are provided the freedom to meander and interact with the crowd. The GM 1000 is the perfect affordable wireless microphone for presentations, houses of worship, vocalists, musicians, DJ’s and public speaking venues.